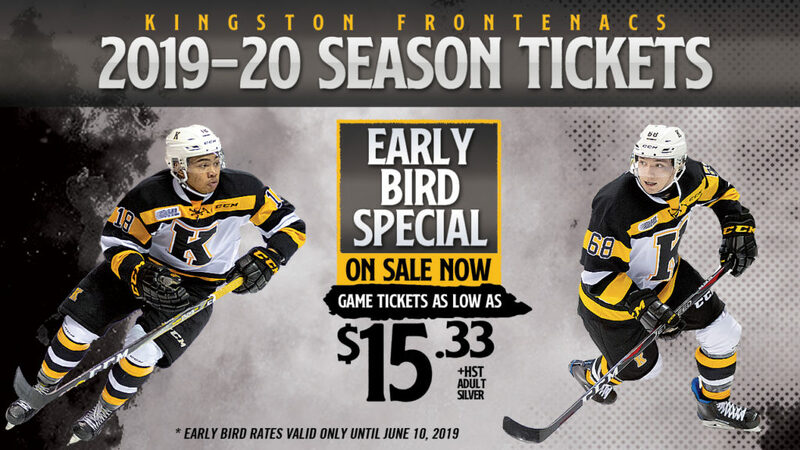 EARLY BIRD SPECIAL PRICES ARE AVAILABLE NOW ON 2019-20 SEASON TICKETS! The Frontenacs turned the calendar on another successful month after collecting 18 of 24 points in the month of November. 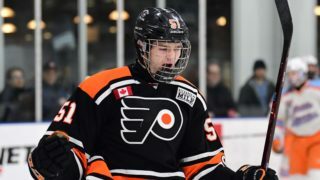 Their first test in the month of December was one of the hottest teams in Canada, the Sault Ste. Marie Greyhounds. The Greyhounds came into the Friday night match up as winners of twelve straight games. 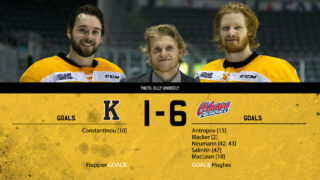 In the only previous meeting of the season the Greyhounds defeated the Frontenacs 6-5 on October 20th. Kingston started former goaltender Mario Peccia in that game, but turned to Jeremy Helvig on Friday as they looked to split the season series with the Western Conference powerhouse. The Greyhounds started flexing their muscle as soon as the puck hit the ice. The majority of the opening frame was spent in the Kingston zone as the Frontenacs struggled to combat the puck movement of the Greyhounds. One player who was not struggling was Jeremy Helvig. The always reliable overage goaltender stole the show in the first period. Sault Ste. Marie seemed to think there was a weakness to Helvig’s blocker side as the majority of their shots were directed there, but Helvig repeatedly shut them down. By the time the buzzer sounded to end the period, the Greyhounds were outshooting the Frontenacs 19-2, but they could not beat Helvig. 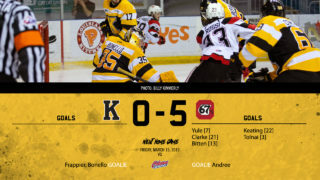 Their goaltender kept them in the game in the opening period, but the Frontenacs needed to improve their play if they hoped to compete with the Greyhounds in the final two frames. The second period got off to a better start for Kingston. They matched their first period shot total in the first minute of the second period. However, it was Sault Ste. Marie that got on the scoreboard first. Keeghan Howdeshell found a loose puck beside the net and beat Helvig for the first goal of the game. It was a goal that could have killed the spirit of the Frontenacs, but it was just the opposite. Just over two minutes later the top line of the black and gold tied the game. Jason Robertson sent a rocket pass across the ice and Linus Nyman was in the perfect position for a tip-in. The goal not only tied the game, but seemed to turn things around for Kingston. For the remainder of the period, the Frontenacs had a better pace and we saw a more evenly played game than we had in the first thirty minutes. Neither team was able to add a goal in the second period and the teams headed to the dressing room tied 1-1. It was a bad start to the third for Kingston. The Greyhounds took a 2-1 lead just 0:18 seconds into the period off the stick of Cole MacKay. Again, Kingston fought back and tied the game minutes later on another sweet pass from Jason Robertson. This time Nathan Dunkley was the one on the other end and he made no mistake to tie the game 2-2. From that point on there was an intense atmosphere to the game. Both benches were standing, and it started to feel like a playoff game. With under a minute left in a tie game, Sault Ste. Marie took a hooking penalty that sent Kingston to a power play. They weren’t able to score in regulation and the game headed to overtime. It was more of the same in overtime for the Kingston power play. 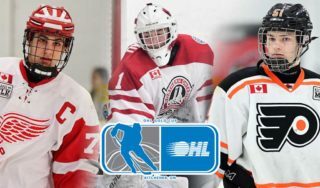 Despite controlling the puck in the offensive zone for the entire power play, they could not beat Matt Villalta and the Greyhounds killed it off. Then came the make up call. Brett Neumann went to the box giving Sault Ste. Marie a shot on the power play in overtime and they cashed in. Conor Timmins ripped one by Helvig to secure Sault Ste. Marie’s thirteenth straight victory. Kingston wasn’t able to get a win, but didn’t completely waste a spectacular 38 save performance by Jeremy Helvig. 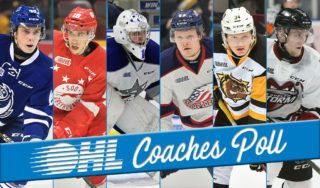 They were able to earn a point against another top team in the OHL and Kingston continued to show that they can be a contender this season. The Frontenacs continue their five-game home stand on Sunday afternoon against the Barrie Colts at 2 PM. They will then host the Niagara IceDogs next Friday night, followed by the Sudbury Wolves on Saturday, December 9th. Both of those games are 7 PM starts.